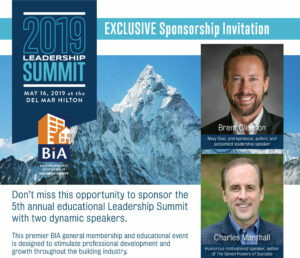 The BIA’s May General Membership Event, our 5th annual Leadership Summit, is just around the corner on Thursday, May 16th. Held at a member favorite venue, the Del Mar Hilton, we’re anticipating a jam-packed crowd at the only professional development event of the year. Want to get your company’s name in front of the industry’s brightest minds? Click here for more information on sponsorship opportunities. At this year’s half-day educational conference we will hear from Brent Gleeson with TakingPoint Leadership and Charles Marshall from M Power Resources. Brent is a Navy SEAL combat veteran and acclaimed speaker on topics ranging from leadership and building high-performance teams to culture and organizational transformation. Charles has over 20 years of speaking experience and provides growth resources for businesses – including his renowned Seven Powers of Success. Word on the street is he’s also quite the comedian! If you’re ready for a morning of laughs and learning, sign up now for the Leadership Summit. Early bird pricing ends April 18th so don’t wait!